When looking at the UK tech-scene as reported, London is often the focus of attention. London being the focal point of Britain’s technology industry coverage is not surprising, due to Tech City being an area receiving considerable investment from the governments in an effort to scale the industry. Over the coming weeks The Startup Magazine will review London as well as other tech-hubs across the United Kingdom, to share what is going on in these areas. This week we will be looking at Scotland. Scotland has developed a tech-hub of it’s own in recent years. 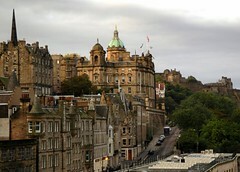 This really began with the company SkyScanner relocating their offices to Edinburgh in 2003. Since then there has been a significant growth in the number of tech startups in Scotland. FreeAgent, SkyScanner, Miicard and the Float app, are a number of startup companies that are thriving in Scotland. FreeAgent – An account keeping software for freelancers and small businesses. FreeAgent was launched in 2007 in Edinburgh and was founded by Ed Molyneux, Olly Headey, and Roan Lavery. FreeAgent have recently become a partner site of The Startup Magazine, and over the coming months will be sharing accounting, book-keeping and accounting advice with our readers. SkyScanner – A flight comparison website. SkyScanner was founded by Gareth Williams in 2001. SkyScanner employs 150 people to date, most of their staff is based in Edinburgh, with a second office in Singapore. Miicard – A real time online identity verification service. It allows a people to prove who they are, to an Anti-Money Laundering standard, without the need for a physical ID check. Miicard was founded by James Varga and has a small founding team based in Edinburgh. Float – A simple to use cash flow forecasting software, for small company owners. Float was founded by Colin Hewitt and Philip Roberts, Float Yard was incorporated in 2010. The Float app also integrates with FreeAgent. Along side all the startups there are a number of websites that are dedicated to report and celebrate the Scottish tech company community. Some of these include RookieOven, Start up Café, The social penguin and My Startup Diary, all discuss startups. All these sites are a great source of information, to find out more about startups in Scotland. To top it all off, if you are interested in starting a company, or joining a tech company in Edinburgh, you should look at Tech Cube Edinbrugh. TechCube is an incubator space set up for art and technology driven firms at Summerhall. They are in the process of reconstructing a decommissioned university tower into a work hub for early stage tech companies in Edinburgh. We are sure many of the companies that will occupy the space in the Edinburgh TechCube, will come from the Edinburgh University Innovation centre. If you would like to add or share more about Scottish Startups, please add a comment.